Milan attraction-guides.com - Milan, Italy attractions guide Milan Galleria Vittorio Emanuele II information about attractions, shops, bookstores, cafes, Piazza della Scala and Piazza del Duomo, King Vittorio Emanuele II, location and address, general tourist information about Vittorio Emanuele Art Gallery in Milan (Milano) area, Italy (Italia) IT - Last updated 30/10/2012. Milan's stylish Galleria Vittorio Emanuele is a large and elegant arcade, situated in the Piazza delle Scala. Lined with numerous speciality shops, bookstores, Milan cafés and a famous restaurant, the Galleria Vittorio Emanuele II dates back to 1865, when it was designed to connect the Piazza della Scala and Piazza del Duomo. The gallery was opened just two years later by the king, Vittorio Emanuele II, its namesake. 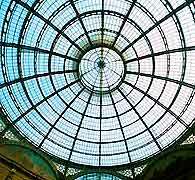 Attractions at Milan's Galleria Vittorio Emanuele II include a 47 metre / 155 foot high glass dome, standing above the central octagonal area, and also some beautiful floor mosaics.